Brian: Do you get Sesame Street where you live? ALF: No, and frankly I don't get it, here, either. Well, I am trying to get the hang of this computer thing, and without opposable thumbs it is very, very difficult, so bear with me if you will. I am Pandora, a cat who has had to sit with my mom and dad as they watch the entire first season of some show called Alf. As my parents were talking about how much they loved the show as they were growing up, I decided to take a break from preening and looking out the balcony doors to watch the show with them. And all I have to say is that it is beyond me how this series was ever successful; as best I can tell, the only redeeming quality of the series is that a cat named Lucky has a fairly prominent role. If you are wondering why a house cat is writing this review for his owner, it is simple—he is lazy, and I just had to offer my opinion of a show I just frankly did not like. I am sure Kevin will come in later to offer his thoughts, but, for now, it is my turn. The show seems to revolve around the Turner family: Will (Wright), Kate (Schedeen), Lynn (Elson), and Brian (Gregory) and their encounter with an Alien Life Form (ALF!!) who is seemingly played by a child actor in a ridiculous costume. Pretty much the weird-looking alien tries to eat the house cat (shame on him) and solves problems while becoming part of the Tanner family. That's it—there is more originality in the numerous taste combinations in my kibble at night. Since I understand that it is all a matter of perspective, I tried my hardest to imagine myself as a young child (human of course) and how the series would seem to me, and I do see the charm. It is a wholesome show (though I do not condone the eating of cats no matter how tasty that alien says they might be) that offers up nothing controversial and is sweet-natured throughout. This is admirable, but even from a cat's perspective, I still know poor quality entertainment when I see it. Mom and Dad have tried to explain to me that shows were not always like the ones on Animal Planet that I watch now and that television programming changes with the trends of the era in which it airs. Taken with this piece of information, Alf is a nice time waster inbetween chasing insects and watching the parents try desperately to win my affection from the other. There is no real storyline to speak of, though there are a handful of other humans that appear on the show from time to time, including a pair of obnoxious neighbors who are certain that the Tanner's are trying to hide something. Also, it is said early on in the series that Alf's real name is Gordon Shumway, though he allows everyone to cal him Alf and he is fine with it. Have some respect, man, do you know how much I hate it when they called me "Pandikins"? I mean, I am a male cat with a female name as it is, so I guess it is all a wash.
Alf does get points for simply being a sitcom that anyone at any age can watch, especially given that it aired during a time that my parents tell me was ripe for new shows that were changing the look of the typical family. Several of the episodes focus on heartwarming situations such as Alf befriending a young blind woman, or selling his spacecraft to buy Lynna new car, or the alien getting a job as a cosmetics salesperson (using "person" loosely) over the phone. There is nothing groundbreaking here, though it is disconcerting to see that the series resorted to a clip show some 12 episodes into its run. But, hey, I am just a cat writing a review who is also seemingly able to operate a PC and has a common understanding of the English language, so you decide which one is more cause for alarm. OK, Dad just came home... Shhhhhh. Bye. Well, while as startled as I am to see that my cat wrote an entire review for me, I do have to admit that the little guy made some good points. I loved the show as a child and tuned in faithfully every Monday night with my family to watch it. My love for the series has changed, and the fact that several of these episodes have been severely cut down from their original running length is unacceptable. 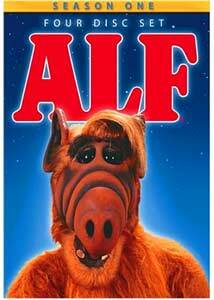 However, I don't mind having ALF on DVD in the least bit. Sometimes you just need to watch the things you liked growing up to make you feel like a kid again. Or a cat. Image Transfer Review: The video for ALF is said to be remastered from its original broadcasts, but there does not seem to be any evidence that this is the case. The episodes shows a a lot of grain and dirt, and the image is soft. Colors are heavily faded and there seems to be a lot of grain in the darker areas of the transfer. Audio Transfer Review: Sound is Dolby Surround and it is as average as one might expect with nearly all of the activity coming from the center channel. Dialogue is fine with no distortion or dropouts. The left and right speakers as well as the surround channels only offer up activity when the theme song is played; for the remainder of the episodes they stay mostly dormant. Extras Review: Alf himself hosts the menu screens on each disc while also offering a brief video introduction for every episode when you select the option for him to do so. A six-minute Gag Reel, as well as a collection of Alf Trivia Facts round out the extra features. By the way, am I the only one who thinks that Lions Gate missed out on a great chance for Alf to do commentary tracks? So I guess Pandora and I are in agreement—the show is fun for kids, although adults who loved the show as children may not have the same opinion now. In any case, it is great that the series is available, though the shoddy transfers and the edited-down episodes make this a very big disappointment.